Alternating between topic discussions and hands-on laboratory experiments that range from the in vitro flowering of roses to tissue culture of ferns, Plant Tissue Culture Concepts and Laboratory Exercises, Second Edition, addresses the most current principles and methods in plant tissue culture research. The editors use the expertise of some of the top researchers and educators in plant biotechnology to furnish students, instructors and researchers with a broad consideration of the field. Divided into eight major parts, the text covers everything from the history of plant tissue culture and basic methods to propagation techniques, crop improvement procedures, specialized applications and nutrition of callus cultures. New topic discussions and laboratory exercises in the Second Edition include ""Micropropagation of Dieffenbachia,"" ""Micropropagation and in vitro flowering of rose,"" ""Propagation from nonmeristematic tissue-organogenesis,"" ""Variation in culture"" and ""Tissue culture of ferns. ""It is the book's extensive laboratory exercises that provide a hands-on approach in illustrating various topics of discussion, featuring step-by-step procedures, anticipated results, and a list of materials needed. What's more, editors Trigiano and Gray go beyond mere basic principles of plant tissue culture by including chapters on genetic transformation techniques, and photographic methods and statistical analysis of data. 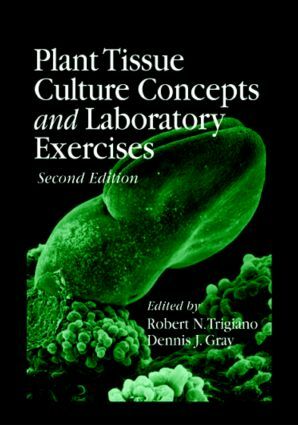 In all, Plant Tissue Culture Concepts and Laboratory Exercises, Second Edition, is a veritable harvest of information for the continued study and research in plant tissue culture science.